New groundbreaking research released from commercial property insurer FM Global and the nonprofit Home Fire Sprinkler Coalition finds fire sprinklers help protect the environment, in addition to preventing property loss and saving lives. 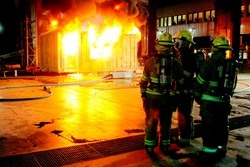 Scientists at the FM Global Research Campus in Rhode Island, USA complete large scale fire tests that have proven automatic fire sprinklers reduce the amount of air and water pollution released into the environment from building fires and reduce the amount of water usage needed to fight a fire. The first-of-its-kind research was conducted as a partnership between commercial property insurer FM Global and the Home Fire Sprinkler Coalition. First-of-its-kind scientific research shows conclusively that fire sprinklers not only prevent the devastating impact of fires but also negate significant environmental risks. Greenhouse gases released by burning buildings can be reduced by 98 percent when automatic fire sprinklers are installed, according to a groundbreaking joint research project released today from FM Global, one of the world's largest commercial property insurers, and the nonprofit Home Fire Sprinkler Coalition (HFSC). The research findings also reveal that a single fire in an unsprinklered building can negate the typical environmental benefits of "green" construction. The study, conducted at FM Global's Research Campus in West Glocester, R.I., USA, sought to identify, analyze and evaluate the environmental impact of fires, as well as determine the effectiveness of preventive measures in minimizing their effect on the environment--issues of increasing global significance. The 1,600 acre, US$125 million Research Campus is one of the largest and most innovative fire and natural hazards research and testing centers in the world. Reduce the amount of water pollution released into the environment. "For most of its 175 years in business, FM Global has conducted scientific fire research to develop solutions that help commercial organizations protect their property and operations," said Dr. Louis Gritzo, vice president and manager of research at FM Global. "Fire sprinklers perform the same way, no matter the kind of building, and now we see conclusively that they not only prevent the devastating impact of fires but also negate significant environmental risks. This is especially important as more businesses seek to design and build energy-efficient, environmentally sustainable facilities." According to Gary Keith, HFSC chair, when sprinklers activate, they control the heat, flames and smoke released by a fire, effectively mitigating the products of combustion. "The fire safety community's efforts to increase awareness of all aspects of fire sprinkler technology will benefit from this new environmental data. Consumers, builders, the fire service, code officials and water purveyors now have a new and important way to view sprinkler protection," Keith said. The complete scientific research findings are available in a downloadable technical report "The Environmental Impact of Automatic Fire Sprinklers" at http://www.fmglobal.com/researchreports. A video about the research also can be viewed on YouTube. For nearly two centuries, many of the world's largest organizations have turned to FM Global to develop cost-effective property insurance and engineering solutions to protect their business operations from fire, natural disasters and other types of property risk. With clients in more than 130 countries and US$6.3 billion in policyholder surplus, FM Global ranks #766 among FORTUNE magazine's largest companies in America and is rated A (Superior) by A.M. Best and AA (Very Strong) by Fitch Ratings. The company has been named "Best Property Insurer in the World" by Euromoney magazine and "Best Global Property Insurer" by Global Finance magazine. The nonprofit Home Fire Sprinkler Coalition (HFSC) is a national, 501(c)(3) charitable organization focused solely on educational outreach. It is the leading resource for independent, noncommercial information about residential fire sprinklers.